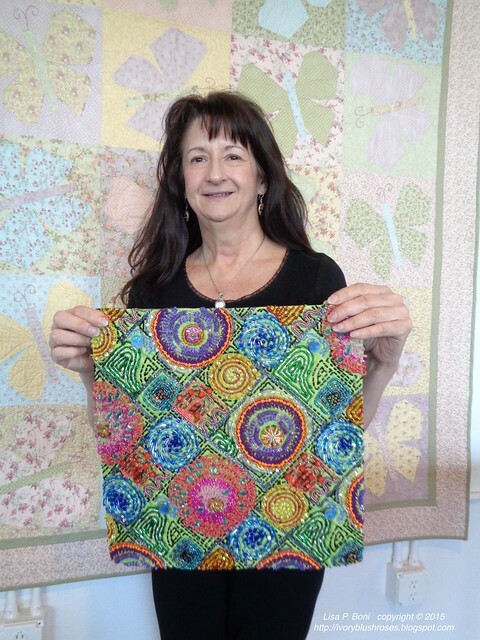 This weekend, the opportunity arose quite suddenly to attend the Colorado Quilting Council monthly meeting to hear Nancy Eha speak. I really enjoyed hearing her speak and getting to see her work in person after having read her books and spending much time on her website, Bead Creative, over the past few years. Then I discovered that there was an open spot available in the workshop! I hope she won't mind my sharing a couple of photos of her gorgeous beadwork!a I love her beaded mandalas and this particular piece was definitely my favorite! 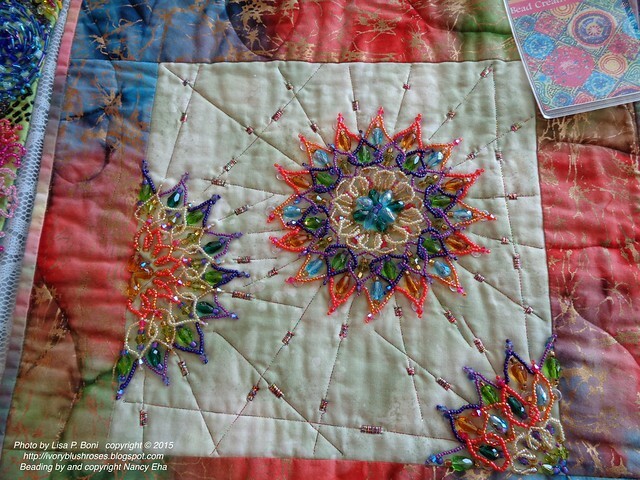 I also love these mandalas with their interwoven layers of beading that float above the fabric. This is the sampler piece that I worked on in class. There was much to learn and not enough time to get the center mandala finished, but I was able to get a start on it! These were my favorite motifs of the day. What you can't see in the photos is that the main beads sit elevated above the fabric. 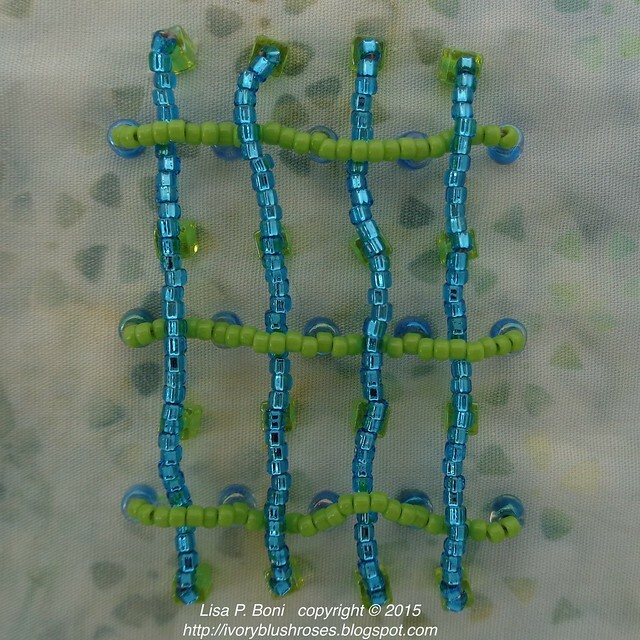 The decorative beads around them are directly on the fabric. When you see it in person, it has a delightful texture to it! We had some cube beads to play with. I've seen them in the bead shops before, but never purchased any as I wasn't sure how I'd use them. Well... that is going to have to change because they add such a nice element! 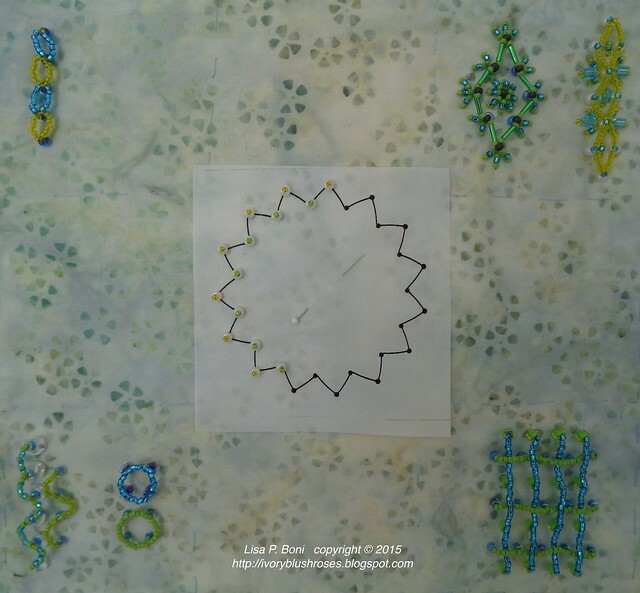 The flat planes capture the light completely differently than the rounded beads. We also tried a bit of elevated bead weaving. Here you can see the platform beads underneath that hold the beadwork off the fabric. We also played with curves and varying the platform heights by adding more beads to it. These "oval" chains were the hardest for me. I could not get them to lay correctly ~ something to work on! 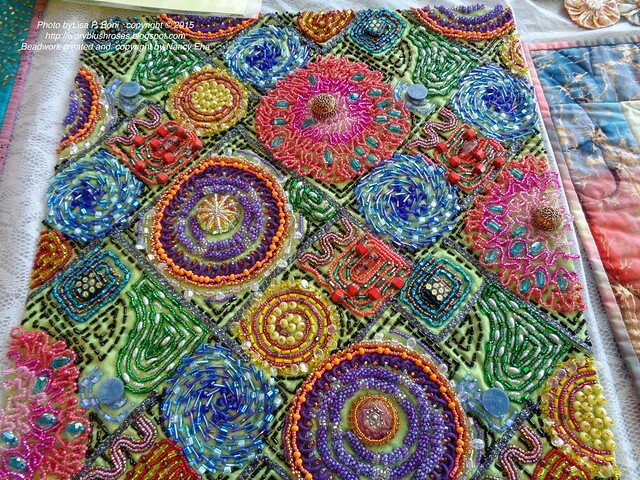 It was great fun to sit and stitch with other like minded folks and to learn a few new things! That's the best part of taking classes ~ even when you "think" you know it all already (something I am guilty of thinking far too often! ), there is always something new to learn, a tip or trick to make something easier or simply to have an excuse to play in a new and different way! In this class, I got to learn some new things, added a few tips/tricks to my bag AND got to play! What an enjoyable time! Thank you Nancy! p.s. Nancy has several books out. 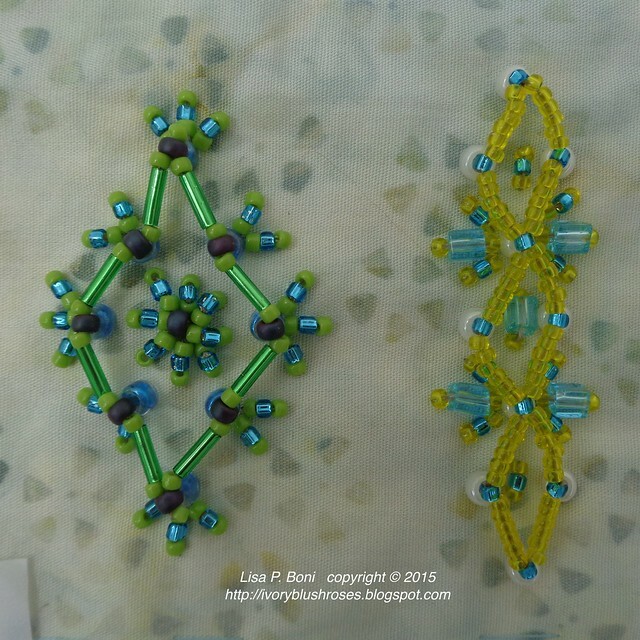 What we learned in class was primarily from her book, Bead Creative Art Quilts. Clicking on the photo below will take you to Amazon, but you can also get it directly from her website; Bead Creative! She also teaches online courses if you are interested! Thank you for your enthusiastic thumbs up! 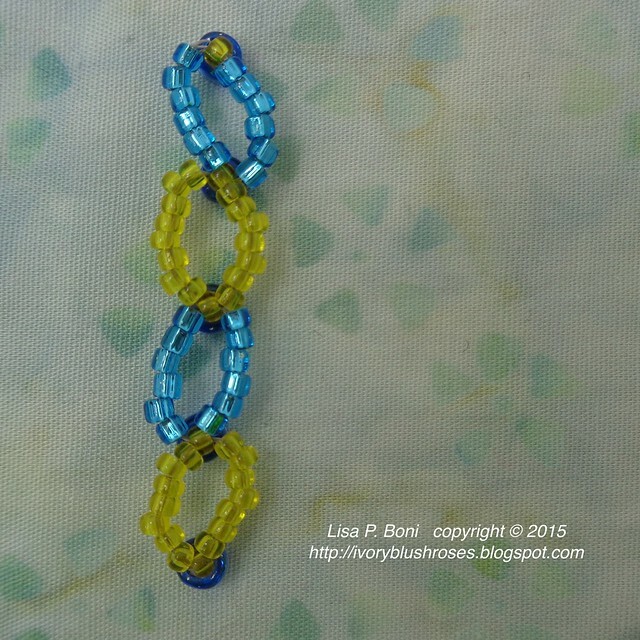 You are off to a great start with your Elevated Beading skills. And a joy to know! 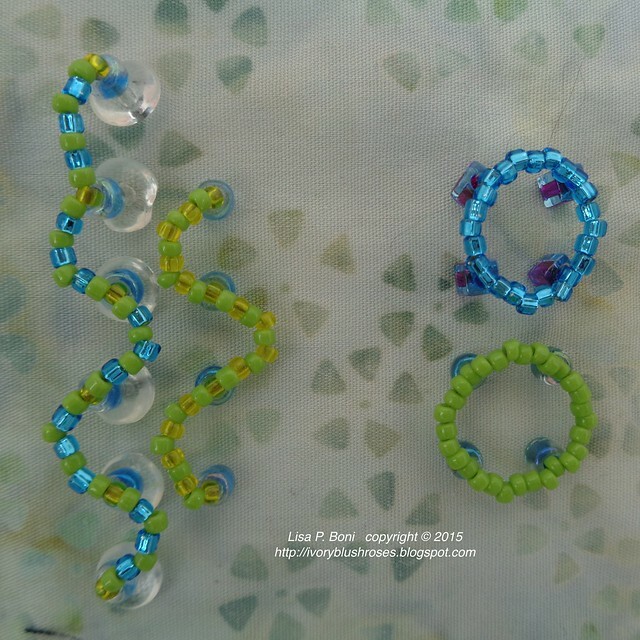 If your readers would like to see more of my beading, I have Galleries, Online Shop, and workshop offerings with photos. Bead On, And Bead Happy! I am a Nancy Eha "groupie." I have all her books and have taken a couple of workshops with her. LOVE her work. Lisa, it seems like there isn't a challenge that you won't attempt. I am always so impressed with your work, and if this is what you accomplish with one workshop, You are a natural. Way to go. It just boggled my mind looking at the examples of what you were doing. Way to go Lisa !!! Wow, Lisa! You amaze me with all that you do. I am glad you were able to attend this workshop and your work looks wonderful to me. I have Nancy's book Bead Creative. I need to delve into it and practice, practice, practice. Go ahead and color me green - pretty envious over here. It's all so beautiful. What an opportunity.